Rudolf Schwarz was born into a Jewish family in Austria in 1905. After surviving the concentration camps, he spent the latter half of his life in England. At the age of six, he began studying the piano and then took up the violin. His father was opposed to his son’s musical career and the young man financed his studies by giving private lessons. He also studied composition, most notably with Richard Strauss. In 1924, he debuted as a conductor when he became assistant to George Szell in Düsseldorf. In 1936, he was appointed director of the Kulturband Deutscher Juden in Berlin, an organization that Goebbels, the Nazi propagandist, initiated so that Jewish artists could perform for other Jews. In 1939, he was imprisoned by the Nazis and in 1941 was sent to Auschwitz. Wilhelm Furtwängler’s wife, Zitia, finally managed to have him liberated but he was subsequently deported, first to Sachsenhausen and in 1945 to Belsen. A shoulder injury he suffered in Auschwitz affected his conducting style for the rest of his life. 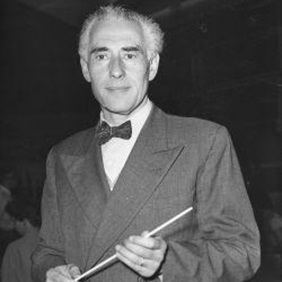 When World War Two ended, Schwarz was asked to conduct the Berlin Opera, a position he declined, and in 1947, he went to Great Britain to conduct the Bournemouth Municipal Orchestra. After several concerts, the orchestra voted unanimously for him to stay on permanently. He was later principal conductor of the City of Birmingham Symphony Orchestra and the BBC Symphony Orchestra, accompanying great musicians such as David Oistrakh and Kathleen Ferrier and much admired by Sir Thomas Beecham and Sir Thomas Rattle.